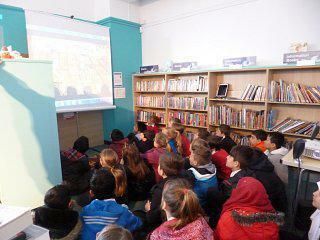 On Tuesday, pupils from Years 5 & 6 were invited to Botley Library to view the final edit of the Shakespeare animation they helped to create as part of the Oxford Shakespeare festival. Six hundred of their illustrations were scanned and edited together to create the short video entitled Battle in Henry IV, part 1. This video, along with the work of two other schools, has now been installed for public viewing not just at Botley Library but also at the recently refurbished Weston Library (one of Oxford University's Bodleian Libraries) as a part of their Shakespeare's Dead exhibition to celebrate 400 years since the famous playwright's death.